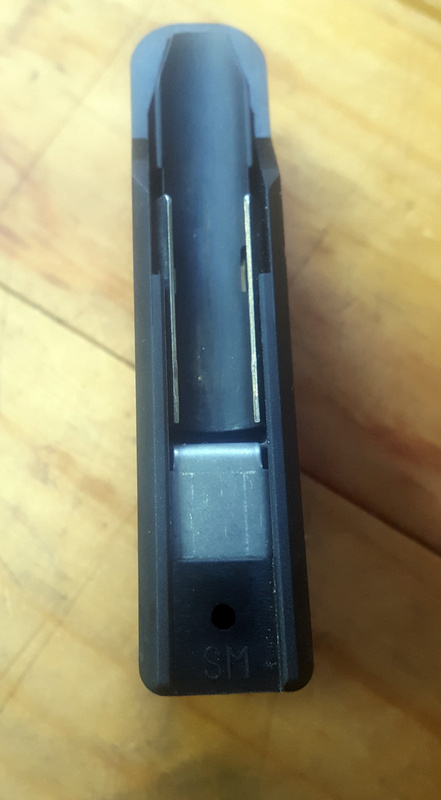 Anyone with a Tikka who has tried to seat long bullets in their reloads, will have come across the problem that the magazine length is way too short in Tikka mags. 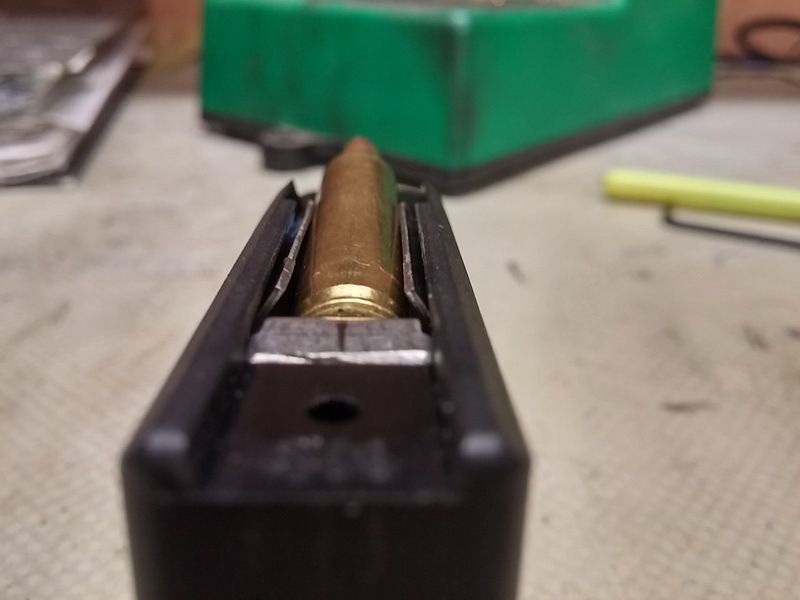 If you shoot a medium sized round it's easy to just buy a mag length bigger and you will have ample room, but if you shoot 223 etc then the feed lips on the mag are too wide, so it's a no go. 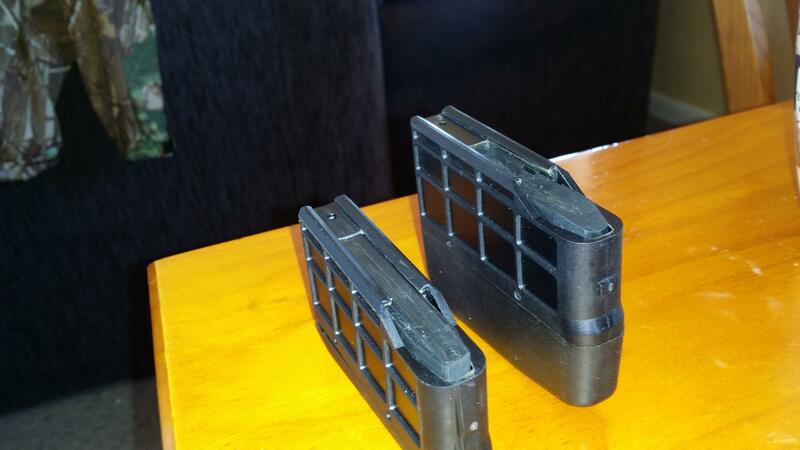 There are other modifications for the 223 magazines online, but I didn't like them too much, mostly because they looked ugly with screws in the sides of the magazine and they also don't fix the other problem on the Tikka that single round feeding doesn't really work in the factory magazines. Recently I was bored at home and was looking into 3d printing stuff and decided I'd try to design a new longer follower that could be 3d printed, that would allow longer bullets and also allow easy single loading of rounds into the rifle. Because the new follower is longer, the back of the magazine needed to be cut out and a spacer put in there. 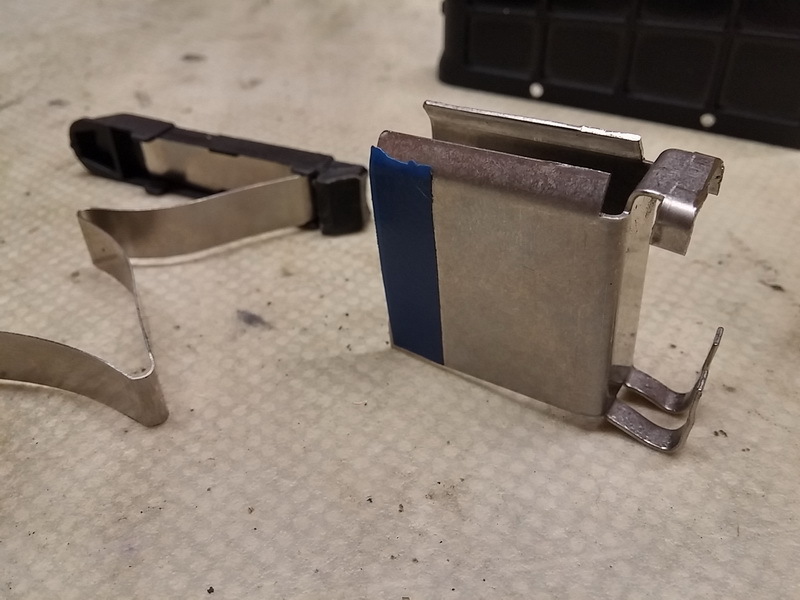 Hopefully the pictures are in the correct order and show the new follower against the normal one, the spacer that is put in the magazine and then the magazine finally assembled. 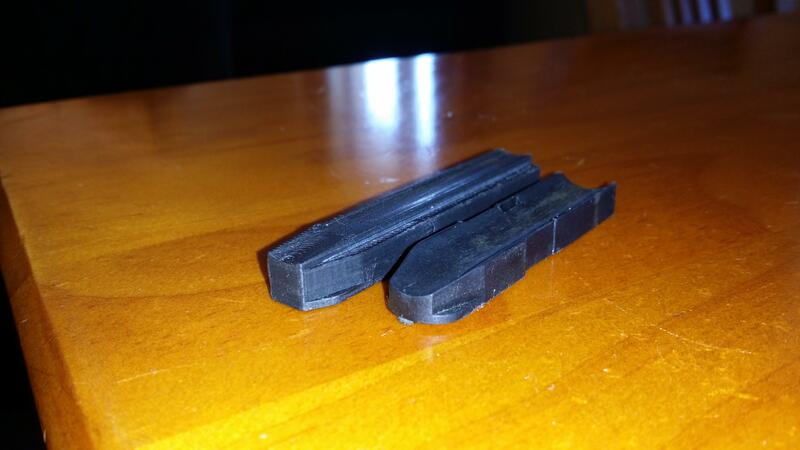 The design work was pretty easy, and I found a website online that links you too people that own 3d printers, so had a guy in Auckland print my designs for me. 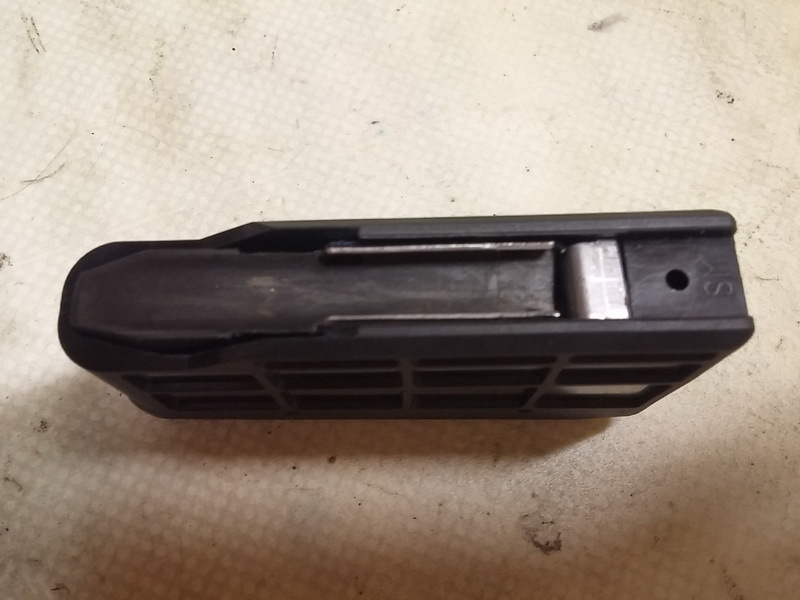 The hardest part of the project was cutting the back out of the magazine, but with a dremel, chisels and files, it wasn't too bad. The new spacer I designed is quite a tight fit so I'm not sure I'll even bother gluing in in place like originally planed. With the back cut out and the new spacer and follower installed, just need to test it out and do any final trimming of material if the follower hangs up on anything. I haven't tested the magazine by shooting the rifle yet, but testing on the couch suggests that the mod works great, the rounds feed well and single loading of rounds into the chamber works too. I have since receiving the 3d prints, re-designed the follower and made a few modifications, and found a different type of 3d printing that will offer a more accurate print and hopefully a nicer finish on the follower. veitnamcam, 199p, Dreamer and 1 others like this. The ones on trade me for about $30 including frieght work well too. Can you link these? I can't find them. I'm on a phone. Search tikka parts or follower. There always there. I'm not sure they are on there anymore, used to be someone from Nelson who made Aluminium ones. 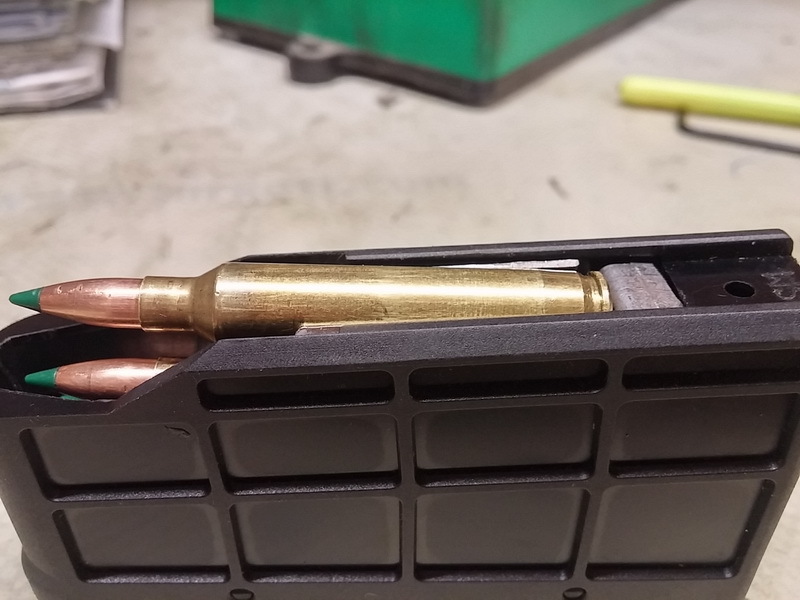 Not sure if they are any good for increasing the length of a 223 magazine though, as the follower needs to sit up above the feed lips for single round feeding and the larger follower might not be able to sit high enough. 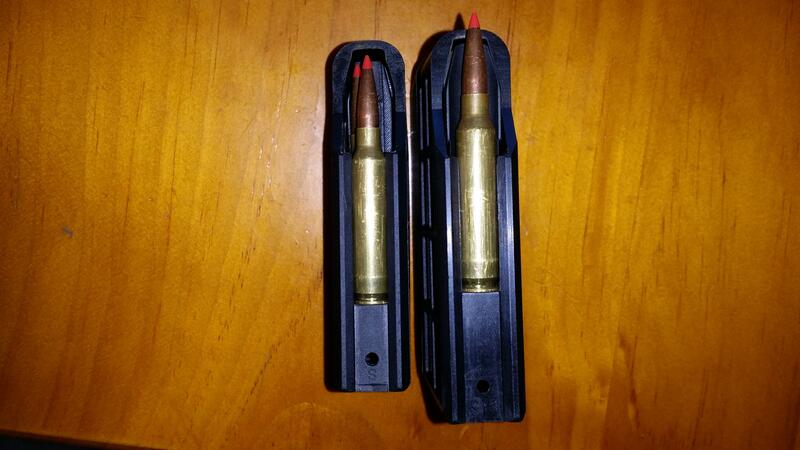 But if you just want to make your rifle single round feed they'd work, if you can still buy them. My magazine was already lengthened. I asked the guy about getting a longer one than standard. But he was nervous to go by my measurements. He wanted the mag sent to him... yes the alloy ones from Nelson. I just got the standard one. It mag feeds well and single shot is fine. 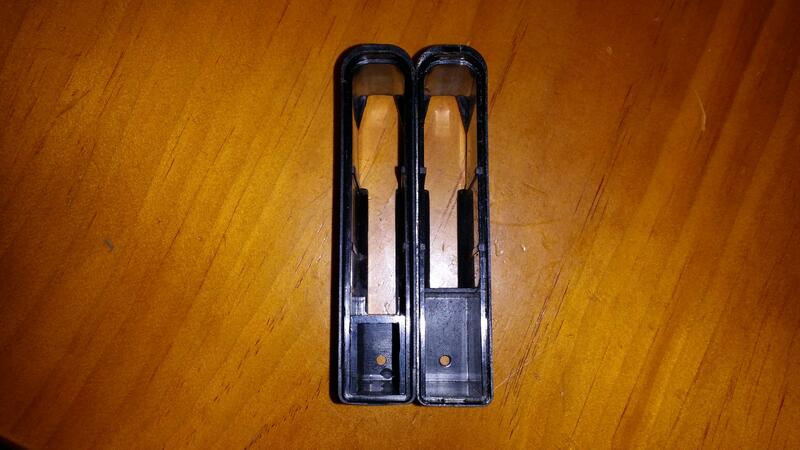 So had a real life test last week, shot a good 30 rounds out of the modified magazine. 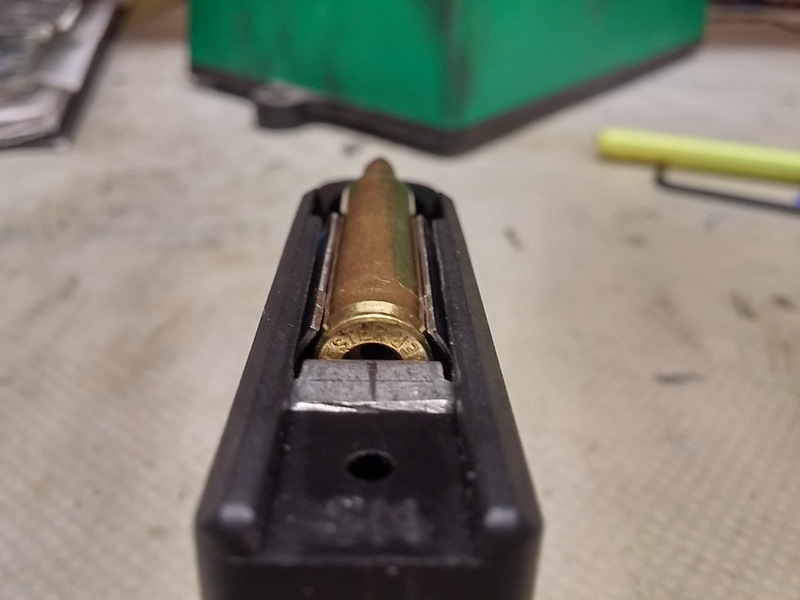 Had some troubles at first due to having installed the follower spring backwards, but after switching it around it worked great in both single feeding and magazine feeding. Pretty happy with how it turned out, so am going to order another follower for my other mag. I don't think so. Well he doesn't seem to be on trade me. Pm kiwi Greg, he knows the guy. Order half a doz I'll take one? Hopefully they ain't moon beams? 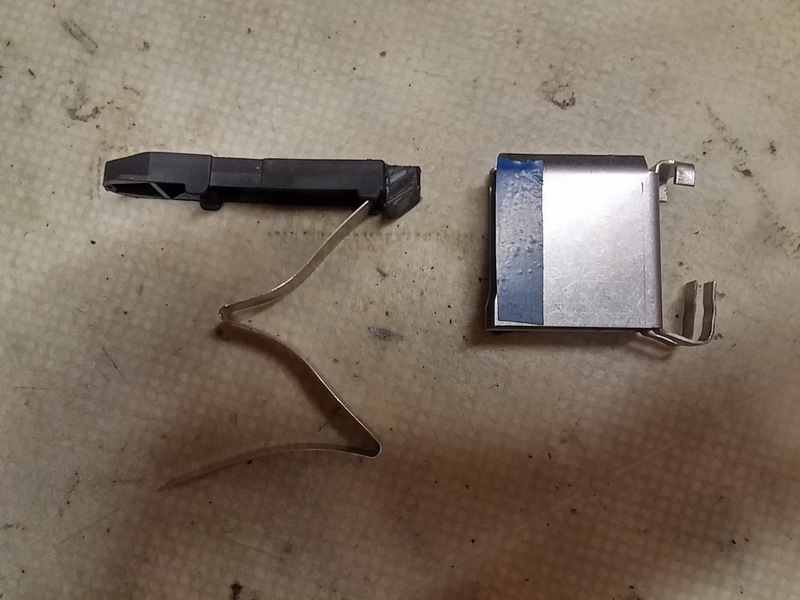 Anyone seen a T3 .223 mag that looks like this (metal part) it says SM on the top. 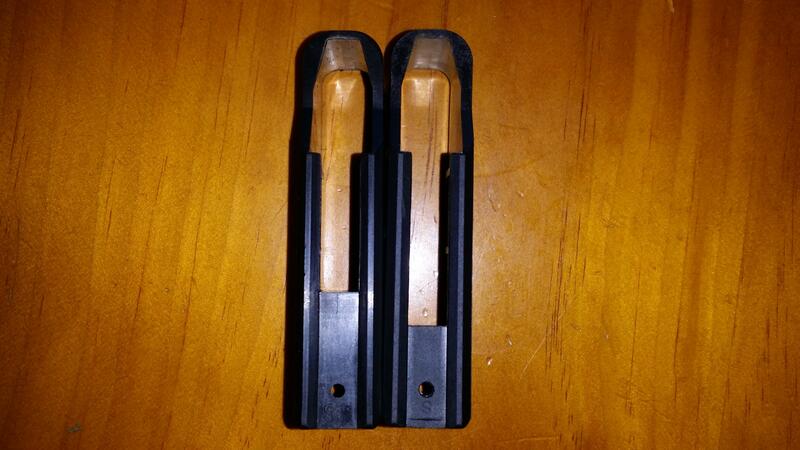 Also the rifle has a Medium sized bolt stop from factory too, not short! Yip mine is the same as that. Yes , we got one like that on our gun. I guess they made a metal follower that fits into their short magnum mag. It could be modified by laser cutting and folding a new stainless sheet metal plate and replace the Existing one. 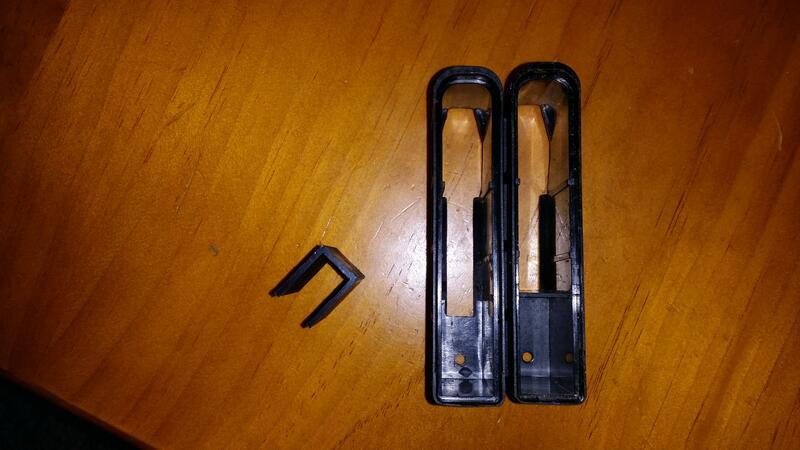 have just tried modified the metal insert 223 mag and dont think its going to work. I glued some plastic on the back end to extend the follower, trimmed back the steel insert same amount, but the problem is that extending the follower and not using a wider Z spring causes the rocking point of the follower to be too far forward, so when you draw the bolt back over the first round, it tips the rim down below the bolt line so it wont pickup when you push the bolt forward. Have tried re-setting the spring tension, moving thee spring back, adjusting the feed lips but nothing will put enough upward pressure on the rear of the follower. Those Z springs are the nemesis of mag modifications. Same problem with getting the Br case to feed in Rem 700's. Browning A-bot scissor spring is far superior spring arrangement. Last edited by NZVarminter; 30-03-2017 at 04:05 PM.